LG G6 review. Welcome to my review of the LG G6. 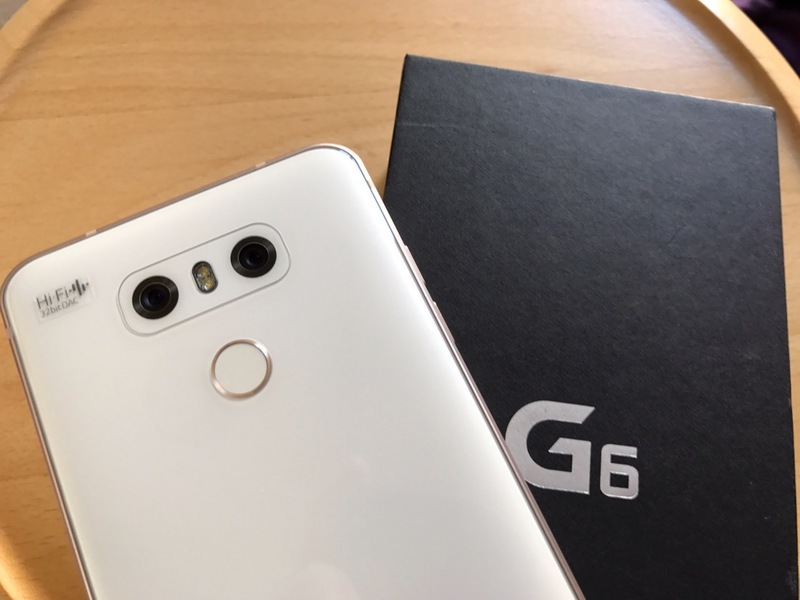 This is Korean G600 version of the LG G6 being reviewed. This review has been compiled by massive input from my wife Ellie and additional input by myself. The Korean version features double the storage at 64gb versus 32gb for the UK. In addition it has a 32 bit quad DAC which can power headphones up to 600 ohms. If your reading this from the USA, you don’t get 64gb or the quad DAC but you do get wireless charging. Come on LG, one model with an equal feature set please across all markets next time! – Display: 5.7″ IPS LCD, 2,880x1440px resolution, 18:9 (2:1) aspect ratio, 565ppi; HDR 10 and Dolby Vision compliant. – Rear camera: 13MP f/1.8 primary camera with 71° field of view, OIS. Additional 13MP f/2.4 wide-angle camera with 125° FOV, no OIS. 1.12µm pixel size on both. 2160p/30fps video recording on both. – Chipset: Qualcomm Snapdragon 821; quad-core CPU (2xKryo@2.35GHz + 2xKryo@1.6GHz), Adreno 530 GPU. – Memory: 4GB of RAM; 32GB/64GB storage (region dependent); microSD slot for cards up to 2TB (practically up to 256GB). – Battery: 3,300mAh Li-Po (sealed); QuickCharge 3.0 fast charging; WPC&PMA wireless charging (US version only). The LG G6 features a 18:9 aspect ratio meaning the phone is narrow. By far it is the easier phone to hold and manage with one hand. It is doesn’t feature and curved edges, just a practical flat edge to grip. It is also drop proof too as would have noticed from the specification, something the iPhone 7 Plus or Samsung S8 doesn’t feature. The LG G6 is water and dust resistant too. The HDR+ screen is beautiful with good viewing angles. It comes with average readability in bright sunlight. The best screen for sunlight readability comes from the S8. Battery life will last a day, predominately because the standby drain is non existent. Screen on time is 4.5 hours in my heavy setup. Fortunately, the G6 comes with quick charge 3. I haven’t needed to top it up yet during the day, although I did get close one day. Cellular coverage is excellent. It pulls LTE when Gavin’s iPhone 7 Plus on the same network is only receiving 3g. Bluetooth is superb. WiFi has been buggy from time to time. After phone has been in standby for sometime, if I went to use WiFi it shows connected, but I have had to toggle WiFi on and off for it to be working properly. If you are in the UK or USA the standard built in DAC is still excellent and IMO better than that found on the S8 or even the iPhone 7 Plus. The standard G6 also has APT-X HD, a Hi-Res Bluetooth codec providing 24bit audio over bluetooth with a compatible headphone. Fortunately, I have been able to test this APT-X HD and the quality is exceptional. However, even normal APT-X is top notch. My AirPods sound better on the G6 than on any other phone including the iPhone 7 Plus or S8. Now lets introduce the Quad DAC. Plug in some decent wired headphones or any wired headphone to be honest. Sit back in your favourite chair and be prepared to be blown away. The Quad DAC works with headphones up to 600 ohm. I would personally recommend using no more than 300 ohm to get the optimal balance. The LG G6 cameras are excellent. With both rear cameras at 13mp the balance is near perfect. Ellie did a 4 way camera comparison with the iPhone 7 Plus, Samsung Galaxy S8, Huawei P10 Plus and LG G6 – CLICK HERE. The LG G6 often nailed the shot better than all the other phones, although the difference is minimal now. So now its about dual lenses and the features these add to the pot. The G6 camera app is great. Lots of ways to take a photo or video in auto, but then there is a brilliant manual mode for photo and video, both of which are better by far than that found on the Samsung Galaxy S8. Square mode and all the other camera modes work really well and are fun to use. See the camera showcase for examples of each option. Ellie – Gavin gave me the LG G6 to take some photos and provide some first impressions. I haven’t given it back to him. It is brilliant. I adore the camera, phone and everything about it. Gavin – Looking at the G6 versus the completion it is by far my favourite phone. The headphone output is tremendous and looking at the photos Ellie has captured makes me very envious that she has the G6 and not myself. Only reason why I didn’t get the G6 is that the UK spec really is stingy! I just got my Huawei P10 plus and you get 128gb storage! I just received my G6, same model. I have my old G5 and pictures doesnt seem to get better. Love 16:9 ratio, hate 4:3 ratio. I dont like shooting with 9.7MP to achieve the 16:9 ratio on G6. Even MP arent everything, thats pretty low. Even more coming from 16MP G5…. Im gonna run some tests on both cameras and decide wich one im gonna sell. LG have tried to make the transition form wide to normal lens as smooth as possible without the loss in quality. Take some more shots. You will see the post processing from the G6 will be better, but on sheer pixel peeping on some shots, the G5 will have more detail. I always shoot at full resolution on the G6 which is 4:3 as you said. I then crop into 16:9 allowing me to frame as I like more. It also seems to get a better quality shot. Unfortunately, Apple, Samsung, HTC and now LG are going for the lower MP and 4:3. I´ve been shooting with boths phones and makes me furioius hehe. Got the G6 for great price, its much better phone but the photos I took with G5 are great. I put both phones together with camera app open and hate how G6 ratio screws it. Also in automatic mode, G6 gives “too much” light. G5 looks more real. Forgot to make one more comment. Have you tried both (G5 & G6) at same time in 16:9?? G5 looks like if it has more panoramic (normal lens). I put one next to the other and G5 captures a bit more…. Yes. The G5 lens is wider but has more distortion. Yes. Just compared both normal and wide angle lenses. In both cases G5 is wider.